This board is equipped with a Wi-Fi Module. 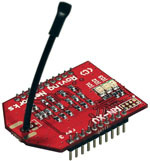 The Wi-Fi communications module adds 802.11b/g wireless communications to the board. The module is powered from the board. The board itself will require 12 volts of power and can be hard wired or you can purchase a "wall wart" type Power Supply at checkout. A Wi-Fi Configuration kit is available at checkout. 1. A Relay can be Directly Controlled by a time schedule. 2. This Relay can be controlled from a computer through a Wi-Fi connection. A computer can take control of any or all relays on a Taralist controller at any time. Once taken over, the Taralist logic will not be able to switch a relay. The computer MUST return control of the relay back to the Taralist Logic for standalone operation.